Six months earlier, I was driving down South Padre Island Drive, in Corpus Christi, Texas, and noticed, on the side of the road, a full sheet of plywood leaning against a utility pole with Carpenters Wanted spray-painted on it. That was very rare - most carpentry jobs in Corpus were filled before the need for advertisement. Not believing my eyes, I pulled into the job site parking lot and walked towards two men standing in the middle of a two-day-old concrete foundation. "Are you the foreman?" I asked, looking at both of them. The taller man smiled and said, "Yes. I'm Daryl and this is Mark, one of our best carpenters. Are you looking for work?" "You bet!" I said. After a short interview, Daryl hired me on the spot, and an hour later I was happy, employed, and building a Chinese restaurant in the afternoon sun. Daryl was a Christian preacher who knew a great deal about carpentry and construction. He was not like any other construction foreman I had ever known. He was intelligent and kind, and treated the members of the crew with dignity. After a few weeks, the crew had grown to eight carpenters and three helpers. Everyone had great respect for Daryl and he deserved it. The crew was made up of several excellent carpenters that, by chance, also specialized in some other unrelated field of expertise - there was Daryl, the preacher; Dave, the military guy (he was an officer in the Coast Guard in between assignments); Ben, a retired Reynolds Aluminum factory worker; Don, the Hill Country "cowboy"; and me? Well... Let's just say I was a carpenter that had a fastination for programming and computers. We all looked forward to going to work each day and felt lucky to have stumbled across the plywood sign that brought us all together. There was also Larry, our boss, the "country boy" from Georgia, whom, even after three months on the job, none of us had ever met. He was the owner of Homesite Construction (the company we all worked for), and was simultaneously building another China Coast in Dayton, Ohio. After a couple of months, Larry called Daryl and asked if he could spare two carpenters to help him wrap up his job in Ohio. Daryl looked at me and smiled, "Our boss needs us in Dayton." Daryl was excited about the idea of a road trip, but I was apprehensive about leaving my wife alone in Corpus for too long. Daryl and Larry promised me the work would only take three or four days, so I agreed to help them out. Daryl left Mark in charge of the Corpus project and the next day he and I flew north to Dayton. I had been a clean shaven fellow, but told Daryl and Larry that I wasn't going to shave the entire time I was in Dayton. If they needed me longer than promised, they would see the evidence of time passed growing on my face. The Dayton China Coast looked almost completely done - it was about a month ahead of Corpus, but needed many small things fixed before Larry could get his final payment. Shane, Larry's only carpenter in Dayton, was busy working on the punch-list, when we arrived. Shane was a long-blonde-haired quality-minded carpenter from Houston, in his early twenties, and had been working for Larry for about six months. It was unseasonably warm in Ohio, especially for January. I wore jeans and a T-shirt the first few days, but the temperatures became cooler as time wore on. The job stretched past the four-day promise, as I suspected it would, and two long weeks later, we were done. A strong cold front blew in on our last day on the job and dropped a foot of snow before sunset. The next morning, in the snow, Daryl and Shane and I packed up Larry's 3/4 ton pickup truck with our tools and luggage, and the four of us began our long journey from Ohio back to Texas. We drove straight through, stopping only for gas and food. We arrived in Corpus Christi around noon the next day. We were beat! When I got home, I went straight to bed without shaving my two-week beard. When my wife got home from work that day, she decided she liked the beard. I trimmed it into a goatee and have worn it ever since. It felt great to be back in the warm south Texas sun. The crew was happy to see Daryl and I back on the job and were eager to hear the details of our Ohio adventure. We learned that, a few days after Daryl and I flew to Dayton, Mark had quit unexpectedly and headed back to Houston. That was strange, if not down-right irresponsible, but I wasn't surprised. Something was up with Mark - problems at home perhaps. He never said and I never asked. After he left, Dave and Ben kept the crew going and the project was moving along. Three weeks later, the Corpus job was over. Our fine team of carpenters wished each other well, said our long goodbyes, and left the job site for the last time. 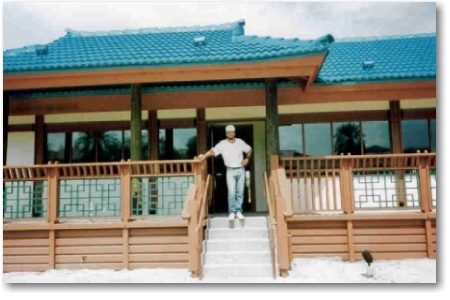 One of the most difficult phases of a construction project is the last day - the job always ends... After the crew departed, Daryl informed me that Larry had recently made a deal to build another China Coast in Tampa, Florida, and was looking for a foreman to run it. Daryl declined the job, so that he could return to preaching, but recommended me for the position. I was nervous about taking on such a big project, but Daryl gave me the confidence I needed, "You can do it. You know as much about building this restaurant as I do." Without intentionally doing so, Daryl taught me a great deal about leadership. In the short time we worked together, he and I became good friends. But after that day, we went our separate ways and never spoke again. Larry offered me the foreman job and, although I was hesitant to drive 1200 miles for work, I thought the experience would be worth it, my wife (Tammy) and I could visit Disney World, and I could maybe make enough money to escape the employment uncertainties of Corpus Christi, and move to central Texas, where jobs were plentiful and diverse. Tammy was excited about the Tampa prospect. That night we made a list of essential items we would need to take to Florida to get us through the six-month stay (1 pot, 1 skillet, 2 plates, 2 forks, 2 spoons, coffee maker, TV, etc.). A week later, we put the non-essential items in storage, and packed up the rest inside the camper shell I had just purchased for my Toyota pickup. We moved out of our Corpus Christi apartment and headed to Houston, where Tammy would stay with her mother and sister, until I found an apartment for us in Tampa. At the end of February, Larry, Shane, and Mark (who had rejoined the crew) and I, left Houston on a Monday morning at 5:00am to begin our 17-hour drive to Tampa. We drove until dark, had pizza and beer for dinner at a restaurant somewhere east of Pensacola, and checked into a hotel for the night. We woke early on Tuesday morning, had a fast-food breakfast, and continued our journey. We arrived in Tampa around 2pm. Before getting settled into the furnished apartment, Larry had rented in advance for the crew, we dropped by the job site to meet Geoff, the project superintendent. Geoff didn't seem too happy to see the four of us - he was expecting a fifteen-man crew. We were also about two weeks late to the party - some of the other tradesmen were waiting for us to build structure so that they could continue their work. "Is this it? Is this your entire crew?" Geoff asked. He had his hand on his cordless phone as if he might call the main office and have us all replaced. I walked up and introduced myself, "Hello Geoff, I am the carpentry foreman. The four of us have each built two China Coast restaurants, one in Corpus and another in Dayton, and are ready to get started on our third. We plan to hire the other 10 or 11 carpenters that we need locally. Meanwhile, we will start building the walls that will keep the electricians and plumbers busy so that the project can stay on schedule." My introduction seemed to calm Geoff (for the moment). "You better!" he yelled, as he turned away and walked back to his job-shack office. His voice was scratchy - probably from yelling at subcontractors all day. After meeting Geoff, the four of us settled into the apartment that would be our home for the next few weeks. After dinner, that evening, with Larry, Shane and Mark, I cleared the dining room table and rolled out the China Coast blueprints to begin planning our first day on the job. 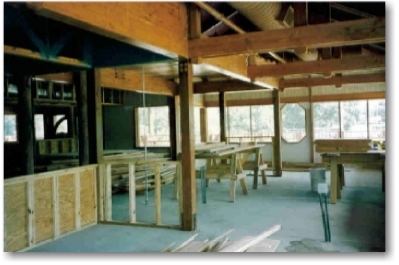 As relatively small construction projects go, building a restaurant can be quite difficult because of the special framing required for plumbing, electrical, gas, stoves, ovens, fry pots, walk-in coolers, HVAC, and other specialized commercial restaurant equipment - you have to study how each piece of machinery attaches to the walls so that you can prepare the underlying structure with the necessary wood blocking before the sheet-rockers go to work. This restaurant's basic wood and metal structure was a box-inside-of-a-box design; an inner structure and an outer structure. The roof over the inner structure had a slight pitch for drainage, but was basically flat and was used to store the HVAC equipment. Parapet walls extended above the perimeter of the flat roof to conceal the equipment and to support the 6-12 roof that surrounded three sides of the building. The surrounding roof tied the inner and outer structures together. The walls and rafters were constructed from standard framing lumber (mostly 2x10s), 6x6 cedar posts, 2x12 cedar planks, 6-inch rough-sawn round posts, and a myriad of various sized laminated beams. During the first week on the job, Larry and I hired the rest of the carpenters and helpers we needed using the same plywood-sign technique Daryl used in Corpus. Mark, who had worked for Larry more than a year before me, was not happy that Larry chose me to be the foreman. I had the years of experience, but Mark had seniority with Larry. Because of this, I knew Mark would be hard to manage, and would resent me for being his boss, so I let him pick the work he wanted to do and left him alone. He decided to become the Sky Trak (large forklift) driver. He spent each day hauling materials from the back of the job site to the restaurant. It was a waste of his carpentry skills, but the job was necessary, and I didn't have the time to do it myself. After a few weeks of spending every waking moment working and living with Larry, Shane and Mark, I found my own apartment, a few miles away, in the same complex where Geoff (who was actually from Orlando) was also temporarily living. Tammy soon joined me from Houston and my home life became normal again as she converted our small apartment into a comfortable transitory home. My workday began at 6:00am. I left our apartment, with a sack lunch and thermos full of coffee, and turned on the radio in my pickup truck in time to catch the morning traffic report, "An alligator was spotted crossing the road near Busch Blvd and 22nd street." Alligators on the road in Florida were as common as traffic accidents. Barring reptilian road blocks, I usually arrived on the job site about 6:30am. I rarely saw anyone on site at that hour. It was a peaceful time to be at the China Coast - the sweet smell of pine and new construction was strong in the calm morning air. I filled my coffee cup from my thermos, lit a cigarette, and wandered around the project to check on the progress and quality of each team's work. Matching up the day's tasks with the crew's various skills and coordinating their efforts around the other subcontractors on the site was a tough job. Much tougher than I thought is would be. I split the fifteen-man crew into carpenter/helper teams (two carpenters/one helper), except one guy, a 65-year-old French-Canadian super-carpenter named BB. He could build just about anything and rarely came to me for help. I paired him with a strong young eager carpenter's helper and told him to make the helper do all of the lifting and toting. Each of the other teams had a lead carpenter that would ensure the work was done as indicated on the blueprints and would consult me if there were any questions. Shane and I had teams too. 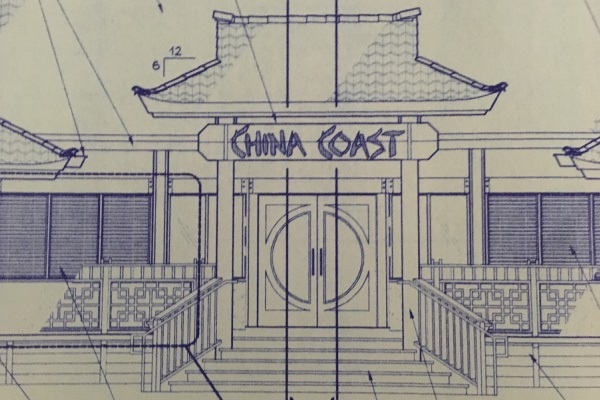 We took the more complex tasks, since we already had the experience of building two China Coast restaurants. At 7am, when the crew arrived, we rolled-out the tools in preparation for a busy and hectic day. This was when I would get the most questions from the crew. "Matt, can you come and look at this?" "Matt, what size are the windows in the men's restroom?" "Matt, we need some more plywood!" "Matt, Geoff is looking for you." "Matt, Do you have an extra hammer?" The mornings were extremely chaotic until the workers got organized and settled into their work. Wait a minute! I thought... There ARE NO WINDOWS in the men's room! Around mid-morning, Larry would arrive with take-out breakfast for Geoff and I. The three of us would talk about the overall progress of the project, labor costs, supplies needed, and what we were going to do for dinner that evening (us out-of-town folks sort of hung-out like family in the off hours). Larry was fond of rare steaks. "Tear the horns off and bring it on!" he would say to the wait-staff. After breakfast, Larry would leave for the day, and I went back to work. When I visited the three-man crews, I sometimes saw things that weren't built quite right. I would ask them questions that led them to catching their own mistakes. It was an effective way to correct a carpenter's errors without making him feel like a fool. At lunch, the crew would find shade inside the building and enjoy a sack lunch. One of the last carpenters I hired was an older gentleman from Boston. During the interview, I asked him how much he wanted to get paid. "At de end o de day, eeya don't like my work, ya don't gotta pay me nutn." he said. I hired him, of course. He turned out to be a great carpenter and fun to work with. He had a superb memory for old jokes and could rattle them off one after another, until someone (not always me) would finally say, " Okay now, time to get back to work!" One afternoon, while standing in one of the unfinished dining areas talking to Geoff, there was suddenly a loud THUD that shook the ground and building. The sound startled all of the workers and halted construction. Not far from us we saw the Sky Trak, with forks fully extended, lying on its side like a dead Tyrannosaurus Rex. We ran to see if Mark was hurt, but by the time we got to him, he had already escaped the dinosaur's cockpit. It was obvious the accident was the result of unsafe hauling. Mark was terrified, but was uninjured. We guided him into the job-shack and sat him down into a comfortable chair. "This accident will be costly and is going to require a drug test," Geoff said to Mark. "You have two options; take the test or quit." Mark chose to quit and the next day he was gone. As foreman on the China Coast project, things settled down in the second half of the day, and I could return to carpentry work to help push the project along. The afternoon heat combined with high Florida humidity made working conditions unbearable and sometimes tempers flared when heat and fatigue would begin to win out over sanity. I thought working with my fellow carpenters in the late-day heat would improve the overall mood of the crew, rather than have them see me retreat to the air-conditioned job-shack every afternoon (which was damn tempting). There are parts of every construction project that are more interesting than others (I'm pretty sure installing baby-changing stations ranks pretty low). Routine tasks like building walls, laying subfloor, or decking a roof, might be fun for some carpenters, but for me, it is just work. Fortunately, the China Coast had plenty of interesting architectural elements to keep the thinking carpenter contented. One hot sunny afternoon, with the help of BB and two helpers, I planned to start setting all of the laminated beams that formed the underlying structure of the front roof and tower. As we made progress, the front elevation quickly began to rise to the sky and take impressive shape. The complex arrangement of posts and beams caught interest from some of the crew and I welcomed them to grab a hammer and join in the fun. Once the beams were all set, there were many rafters that needed to be cut and nailed in place in order to complete the front roof structure. There were four main sections of the roof; the left side, the right side, the middle, and the tower. We split up into three teams. BB and I took the middle section and tower, and the other two teams each took a side. A cloud moved in and temporarily blocked the sun, which kicked up a welcomed breeze. We were working fast and happy, cutting and installing rafters at top speed, barn-raising-party-style, while the helpers cheerfully struggled to keep us supplied with material. By the end of the day, the structure was completed and the crew was on top of the world. We had made remarkable achievement and were proud of our work. It was a great day at the China Coast! On all of my favorite construction projects of the past, at the end of the day, the foreman would buy beer for the crew. I honored this fine tradition as often as possible and each time looked forward to enjoying a few brews with our worthy crew. Most of the guys drank Budweiser, but I preferred Milwaukee's Best (at the time). Even though the guys gave me a hard time for drinking "The Beast," I would make cheerful spectacle of my effort to dig to the bottom of the ice chest, past a sea of Budweisers, to get my hands on the last Beast! One afternoon, Geoff stormed out of the job-shack yelling, "Everyone stop what you are doing!" In an instant, the job was over. 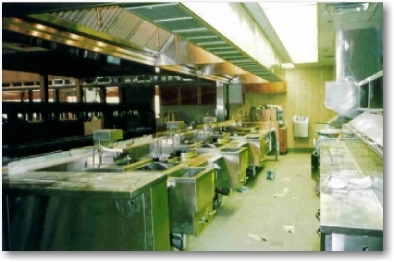 The owners had decided to shut down the 50+ national restaurant chain. The entire crew was shocked - we still had at least a month of work to do! A few minutes before Geoff gave us the news, the truck carrying the China Coast sign arrived, seemed to slow down, but not quite stop, before exiting the parking lot with the sign still strapped to the flatbed trailer. Larry and Shane went back to their apartment to pack up their stuff and left Tampa for Houston the next day. The project ended sooner than I expected (or wanted), but after quick evaluation, I realized that I achieved my objective in Tampa and it was time for Tammy and I to head back to Texas to move on with the next phase of our lives. It has been over 20 years now. I ended up in central Texas, as planned, and eventually became a programmer and systems engineer. Although the China Coast restaurant chain was a failure for the owners, it was a life changing event for me that I will never forget. I've lost track of all of the people I met and knew during my short time working in Corpus, Dayton, and Tampa, but I hope they all learned something valuable, are living happy lives, and have fond memories, as I have, while building the China Coast.